I've decided to mod my Ducky Shine 2. This will follow my (re)build now that I have all the parts (i.e. lube and stickers) I need to complete it. Edit: Reuploaded images. RIP Dropbox Public Folder. Bob has a pretty exciting life. Makes me want a novelty cap companion for some photobombing as well. Going to see if I can have the plate sand blasted to save time on sanding. I'm probably going to go with a metallic silver for the plate. Son: "Daddy, can I have my own custom keyboard?" Me: "That's my boy! But better ask you mom." You need your own Bob with a custom paint job like a mascot! Update: I had the plate sandblasted today! I really like the raw metal look but I have to prime and paint it to keep rust/corrosion in check. Probably going to go with a metallic silver. The soldering begins tomorrow morning...108 switches and 108 LEDS...Hakko 936 don't fail me now! It looks really good! Great choice of parts, looking forward to how this turns out! Beautiful! Definitely proud Now just make sure to not use alcohol when cleaning the plate in the future. Thanks! All I need now is to design some housing that will be compatible with the stock plate. Before painting and between layers is okay . I meant now that its finished, don't clean it with alcohol--it will dull the finish. When I tap on the plate with my finger nail it sounds It sounds more solid. The sames goes with the bottom housing. Ok, I've soldered all the switches and tested them. Now that I've confirmed all the switches work, it is time to solder all the LEDs. Very nice pics and awesome job!! From a fellow shine 2 owner. Thanks Ray! Not a pro but I try my best to get the right shots. Thanks BakaPhoenix! Good idea! 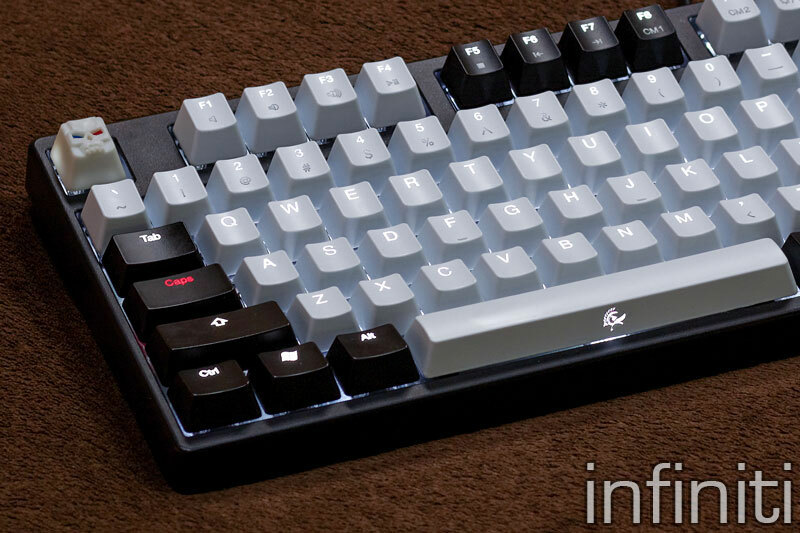 I think I'll order a full set of clear keycaps from Signature Plastics in November while they have that shipping promo. If it doesn't look good on the Shine 2 then I'll put in on my QFR at work...that'll ensure no one ever borrows my keyboard again haha! Can you take a picture of the keyboard in the dark? I want to see how much light the silver plate reflects. Looks pretty awesome! Now what are you going to do with the top, if anything? I think it's good as is, because the plate and LEDs are already flashy enough. More like I'm curious if there are further plans . The paintaholic and modaholic in me wants more! No problem...I'll do that later and post pictures. Haha...I have to admit that when I reassembled everything I was a bit disappointed that it still looked the same...a plain jane lookin' Shine 2 hiding all its internal mods. As for painting the top case, I want to but I'm afraid that spray paint would just rub off at the corners over time. One option is to have it painted with automotive paint. Another option I am considering is a cerakote gun finish but I still need to find out if the plastic will survive the oven curing process needed for the oven cure series. If not I'll see if the cerakote air-dry series is just as durable. I need to talk to my gun nut friend. I don't think the plastic will survive an oven heating session. For automotive urethane paints, Id strongly recommend that you have a professional do those, unless you want to invest in a lot of protective equipment, like a chemical filtering mask, full body suit, good ventilation. This is why I stick with oil enamels. Just went over the cerakote documentation and it just might work. The cure table lists plastics and polymers for 2 hours at 150-180 deg F and ABS melts at 221 deg F. BUT I need to get a professional opinion from the gun smith that does the application...and see what color options are available. However if I go with automotive paint, I'll have a larger selection of colors. Oh and I'll have that done by a professional...I need it done right the first time. It's not like I can pick-up a spare as easily as a QFR case. Melting temperature may not be reached, but it might still get warped / deformed / shrunk, etc. I've tried near-boiling (but not quite) plastic that I thought would be safe, which was a dumb idea (unrelated to keyboards)--nothing melted, but there was a serious amount of shrinking and deformation. OK. Automotive paint it is! Woah, that looks amazing! The silver plate relfects some light too. Awesome! Thanks for taking the picture :). That looks beautiful. Are you going to paint the casing as well? Was that how the original lighting brightness was? Thanks! Yes, I will paint the case. I was going to try some True Metallics Plasti Dip (Anthracite Grey and Aluminum Silver) but the supplier is closed on account of the super typhoon here. I'll probably get the plasti dip next week. Regarding the original lighting...I sadly do not have pictures of when it was stock. I have noticed that it is not as bright as before the mod since the illumination is more diffused as a result of the transparent switch top cover. The brightness used to be set to level 2 before the mod but now I keep in on level 3. Before the mod, the legends on the lower part of the keys were darker compared to the legends on the top of the same key since the LED is on the top part of the switch this just means that the "!" was brighter than the "1" on the same key. After the mod, the lighting is a bit more even but I can't really say for sure. for the plates, must you remove the original black paint first before spraying it with a new paint? if you didn't remove the original paint and you spray the new coat of paint over it, what would be the problem? dun think i can afford to sandblast it, what about using sandpaper if removing the original paint is a must? i own a ducky shine 2 too and i'm interested in painting the plate to make the LED light more reflective. Sorry but I'm not sure about painting over the original paint/coating. 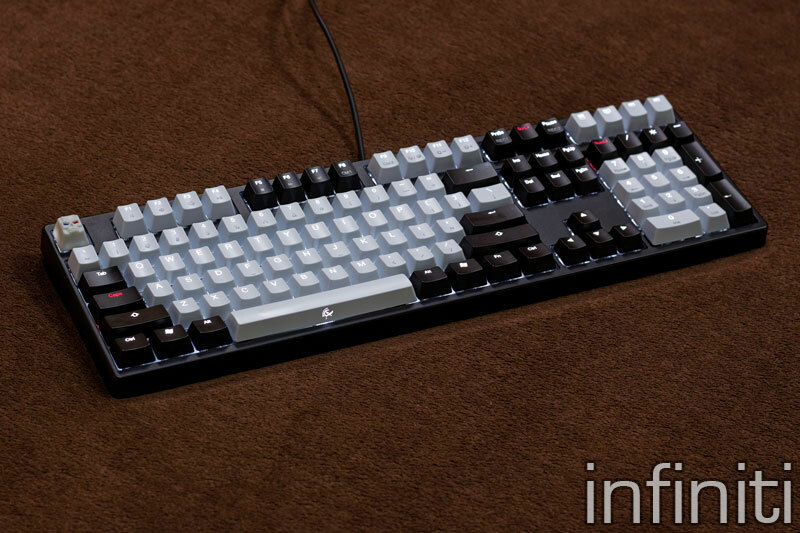 Check out Photoelectric's Keyboard Case Painting Tips. He's the resident paintaholic so he would be in a better position to answer you. Anyway, when I consulted with Photoelectric regarding this project, he mentioned that he sanded down the powder coating on a Filco plate and then applied adhesion promoter before painting the plate. More info and pics in this post. I couldn't find adhesion promoter locally so I went with Rust-oleum Universal (Paint & Primer in One) in Titanium Silver. You can spray right over powder coating of you're going to use an opaque color. Just clean / degrease Really well before painting. Sand the surface very lightly to give it some porousness for new paint to adhere to. Thank you so much for your knowledgeable input and pointers! Firstly, I need to do more homework and research about paints and stuff, which is what I'm doing now. Secondly I'll need to find the time to desolder all those switches and LEDs from the board. I haven't removed Cherry stabilizers before, are they difficult to remove? When you do disassemble your Shine2, take some reference pictures to aide in reassembly. The plate mount cherry stabilizers are easy to remove. First, remove the LED and switch. Second, lift the stabilizers from the area encircled in red. It will lift upward and then towards you. definitely taking pictures before taking them out apart! i was under the impression that in order to take out the cherry stabs, you first need to desolder EVERYTHING, am i right or am i wrong? Well, the minimum you need to remove is the LED and switch and that the stabilizer is for. Finally got the Plasti Dip! Left to right: True Metallics Plasti Dip (Anthracite Grey, True Metallics Plasti Dip Aluminum Silver), and plain jane matte black for the car. Going to do some painting dipping experimenting this weekend. I was considering buying some to do a carbon fiberish paint job. Nope, haven't seen that. Thanks Ray! I'm going to let it cure/harden over night and I'll fit it to the keyboard tomorrow. Alright, it's been a day since I painted/dipped my Shine 2 top case with 5 coats of aluminum silver plati dip. The surface texture feels silky but the friction of running your finger across it tells you that it's a rubber coating. It seems to have dried enough that my fingernail doesn't leave a mark. However, I'll wait another day or two before I try to do a scratch test with my fingernails. I expect it to have a more dry feel once completely cured/hardened. Almost! I tried pulling of some keys in the F row and there are small nicks where the wire keycap puller made contact with the case It's behind the keycap so out of sight out of mind. I may have been too eager to install the case. I think the plasti dip didn't dry very well. I blame it on the 80-90% humidity here in the tropics. Well, I can't tell from the photos. So to me it looks perfect! Just right. wow! very nice! you paint it over the black case? how you get the work geekhack on it?